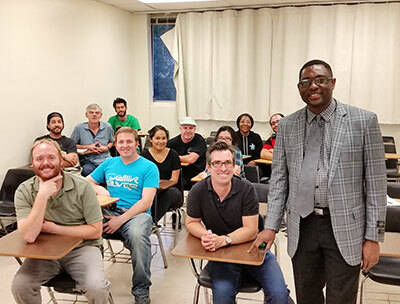 Fulbright Visiting Scholar Kenneth Oben Eyong from Cameroon visits with students from the San Diego State University during his OLF, 2016. The Outreach Lecturing Fund (OLF) provides funding for campuses to host Fulbright Visiting Scholars, already in the United States, for short-term speaking engagements. To see a list of current Visiting Scholars in the U.S. please visit our Scholar Directory. The OLF travel award is designed to enrich both institutions and Visiting Scholars through lectures that will promote academic disciplines and cultural understanding. Additionally, the OLF seeks to build relationships and partnerships with institutions that are currently underrepresented within the Fulbright Program as a means to promote future opportunities. These Priority Institutions include: Minority Serving Institutions, Community Colleges, Small Liberal Arts Colleges, Women’s Colleges and Art Colleges, and geographically underrepresented institutions. The scholar must be on a grant of at least three months. The application for a scholar to receive an OLF award must be submitted at least one month prior to proposed lecture. The scholar cannot participate in an OLF award within the last month of their Fulbright Grant. Each scholar wishing to participate in an OLF award must have a valid SSN or ITIN at the time of application. The scholar will upload a copy of their card to the Scholar Portal. Travel must be at least 75 miles away from the scholars host institution to qualify for an OLF award. All OLF travel must include a lecture to a priority institution. View a listing of potential Priority Institutions for more details. The length of the lecturer's stay at the institution will depend upon the particular interests of the academic community and the facilities available. The period, however, should allow an opportunity for the scholar to become acquainted with the host institution. A program of two to three days is suggested; a longer period may be advisable if a visit to more than one institution is planned. The principal intent of providing the OLF travel award is to build relationships with institutions that are currently underrepresented within the Fulbright Program. Visiting Scholars can benefit U.S. students and faculty of host institutions and their communities by discussing their Fulbright experience, speaking about their home culture and country, and by providing access and expertise in their fields. Fulbright Visiting Scholars, whose grant length exceeds three months, are strongly encouraged to maximize the impact of her/his exchange experience by giving lectures to various U.S. audiences of higher education. The U.S. Department of State provides these travel awards (through IIE/CIES) to scholars to help offset the cost of traveling within the United States to interested institutions. Please note: Scholars will not receive funding for trips to meet with colleagues and friends in other parts of the United States, or to attend conferences. Institutions must apply for an Outreach Lecturing Fund at least one month in advance of the proposed lecture. Additionally, Fulbright Visiting Scholar’s cannot attend a grant within the last month of their grant period. The application for a scholar to receive an OLF award must be at least one month prior to proposed lecture. Each scholar wishing to attend an OLF award must have a valid SSN or ITIN at the time of application. The scholar will upload a copy of their card to Scholar Portal. Each scholar must registered their U.S. Bank Account through IIEPay. Detailed instructions can be found online. All OLF travel must include a lecture to a targeted institution, please see the target institution list for more details. Minority Serving Institutions (Asian American Native American Pacific Islander Serving Institutions AANAPISI, American Indian and Alaskan Native Serving Institutions AIANSI, Historically Black Colleges and Universities HBCU, Hispanic Serving Institutions HSI, Tribal Colleges and Universities TCU, and Predominately Black Institutions PBI. To see a comprehensive, but not exhaustive list of contacts for our potential partner institutions, please view a sampling of Priority Institutions. The U.S. Department of State provides funding, known as the Outreach Lecturing Fund (OLF), through the Council for International Exchange of Scholars (CIES), to enable Fulbright Visiting Scholars who are in the United States, for a grant longer than three months, to accept guest lecturing invitations at colleges and universities throughout the U.S.
You should receive a letter of funding approval (or disapproval) for your application from CIES within one business week. Faculty and professional staff of U.S. colleges and universities can identify scholars to invite to their campuses for Outreach Lecturing Fund visits by consulting the Fulbright Visiting (Non-U.S.) Scholar List. After a suitable visiting scholar is identified, representatives of the inviting U.S. institution may contact the scholar directly via the faculty associate and host institution department information on the list, or they may contact CIES staff directly. Within one week of receiving the application, CIES will inform the requesting institution and scholar whether or not the Outreach Lecturing Fund Travel Award has been approved. The scholar is responsible for purchasing an airline ticket or arranging some other means of transportation, such as a train, bus or rental car. The Fulbright Visiting Scholar will receive the approved OLF travel award through a direct deposit into the scholar’s U.S. bank account within three weeks after the completion of OLF visit and the submission of all evaluations and documentation to IIE. If you have not set up IIEPay, please follow the registration instructions here. For required documentation, please consult the application materials. What is the purpose of the OLF Award? Where can a scholar go on an OLF Award? What documentation is needed for the approval process? Who is responsible for making the travel arrangements and paying for the transportation? Can scholars go to more than one institution during an OLF award? How is the OLF travel award amount determined? When will the scholar receive the OLF travel award funds? What documents are required after completion of the OLF travel? Our institution wishes to issue an honorarium. What are the requirements? Our institution cannot provide housing for the scholars, is there a possibility to receive supplemental funding? Are there limitations for how many OLFs a scholar can receive? Are there limitations for how many scholars an institution can request? The scholar I am interested in is only on a grant for 2 months, are they eligible? I am a current Fulbright Visiting Scholar and I am not listed in the Scholar Directory, what should I do? Our institution is not listed as Priority Institution, is there a way to be considered a Priority Institution in the future? The OLF program enables Fulbright Visiting Scholars and Scholars-in-Residence who are currently in the United States for grants longer than three months to accept guest lecturing invitations at U.S. colleges and universities. Scholars must go to a college or university in the United States and its territories, including Puerto Rico, the U.S. Virgin Islands and Guam. OLF may not be used to attend conferences. Scholars can go to any institution including large research institutes; however scholars must supplement those visits with a second visit to a targeted institution. These include Minority Serving Institutions, Community Colleges, Small Liberal Arts Institutes or Geographically underrepresented regions. For a complete list of targeted institutions, please click here. Institutions must submit the OLF application form together with an invitation letter on behalf of the scholar. Fulbright Visiting Scholars being requested must submit a copy of their Social Security Number (SSN) or Individual Taxpayer Identification Number (ITIN). The scholar is responsible for making her/his travel arrangements and purchasing the travel tickets. Yes. Scholars are strongly encouraged to visit more than one institution during their OLF experience. For example, a scholar could use one OLF award to go to Northern Virginia Community College and Howard University. Both institutions are located in Washington, DC. The award amount is based on a fare available for travel on the date the application is approved, rounded up to the nearest $100 with an additional amount added to offset the cost of local transportation to and from the airport. The CIES OLF contact will email the scholar an approval letter and a copy of a travel itinerary, including fare, for reference. For example, if a fare of $321 is available, the OLF award amount will be $400. The scholar may choose to use the route in the sample itinerary or not. The scholar is encouraged to purchase tickets for the OLF travel promptly upon receiving the approval letter. Waiting until closer to the travel date to purchase tickets may result in higher travel costs. The award amount is set the date the trip is approved and is not changed based on actual costs. The scholar will receive the OLF travel award funds after the OLF host institution submits an evaluation and summary of the event. Scholars are required to register their U.S. Bank Accounts through IIEPay in order to receive OLF funding. You can find detailed instructions on registering for IIEPay here. Scholars will receive payments within 3-4 weeks after all documents are submitted. Please note: Scholars cannot be reimbursed without a copy of the scholars SSN or ITIN. Institutions submit an online evaluation after the event and are asked email a summary including pictures from the lecture. Scholars must register for IIEPay. Institutions are welcome to issue Visiting Scholars an honorarium, however they must refer to the Employment/Honoraria (PDF) section in the Guide for Visiting Fulbright Scholars for information on the steps you must take to obtain the approval. Once they alert IIE/CIES that they will be granting an honorarium in the Official Invitation Letter and applications, IIE/CIES will submit a request to the Department of State’s Bureau of Educational and Cultural Affairs for approval. Once approval is granted, we will provide documentation to both the host institution and the scholar. Institutions that are on the Partnering Institution list can request supplemental funding and will reviewed on a case by case basis. Please indicate your request on the application and within the invitation letter. Preference will be given to scholars who have not yet completed an OLF, however there are no limitations on how many OLFs a scholar can receive, provided that they are being invited by eligible host institutions. Institutions are encouraged to apply for up to two OLFs per semester, but may request additional OLFs by emailing OLF@iie.org. In order to be eligible, scholars must be on Fulbright grants of 3 months and they cannot participate in an OLF during the last month of their grant. If you are a current Fulbright Visiting Scholar and you do not see your name in the directory, please contact your CIES Grant Administrator. They can help determine why your name does not appear. The Priority Institution Excel Document is updated twice a year and we conduct research on eligible institutions. If you believe your institution falls into one of the categories, please email your request to outreach@iie.org.